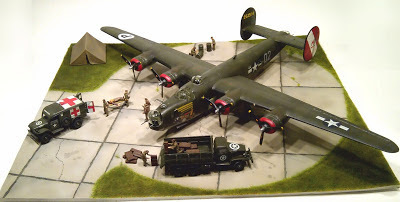 A simple diorama base can enhance your model aircraft display enormously. Something about seeing a model on a representation of it's "natural habitat" rather than a blank shelf takes things to a whole new level. In this post I will show you a relatively quick and easy way of building an effective WWII era concrete airfield base. The only specialist equipment you will need is an airbrush. I always use acrylic paints but there is nothing in here that would not work with enamels. I use foam board as a base for all my dioramas. It's easy to obtain (any DIY or craft store will stock it), it's light and easily cut to size and shape. It usually comes in large sheets of about 5mm thickness which is ideal. 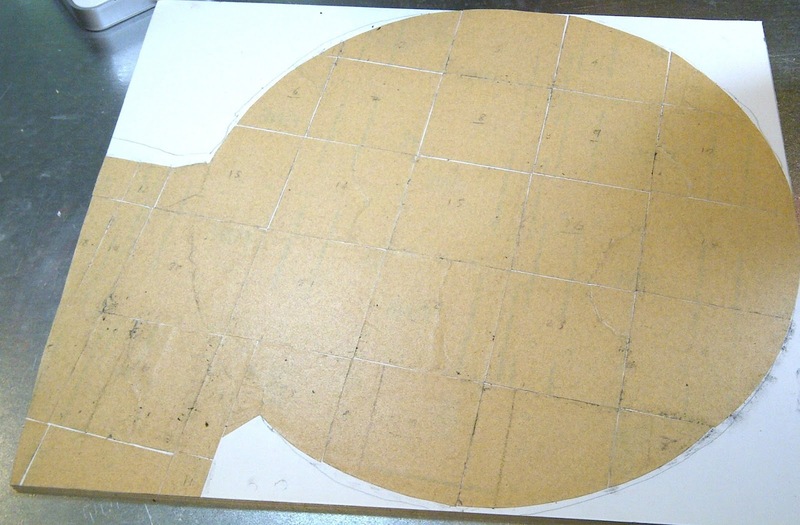 First cut the board to the required size, which will depend entirely on your design and it's intended location. Also, if you want to place it on a wooden "plinth" then this may also dictate matters. I often use custom made picture frames for this purpose but I am not covering this aspect in this post. Next you need to decide the size and shape of your concrete area. This is entirely down to you but in this example I am showing a circular hard stand area surrounded by grass with a section of it opening out to the edge to connect with what is (presumably) a larger apron. By all means sketch it out on to the board as a guide. To represent the concrete, I use regular sandpaper from any hardware store. It comes in various grits - fine grit works well for 1/72 scale but you could use medium grit for larger scales. It gives a nice "rough" texture to the concrete that is very realistic. 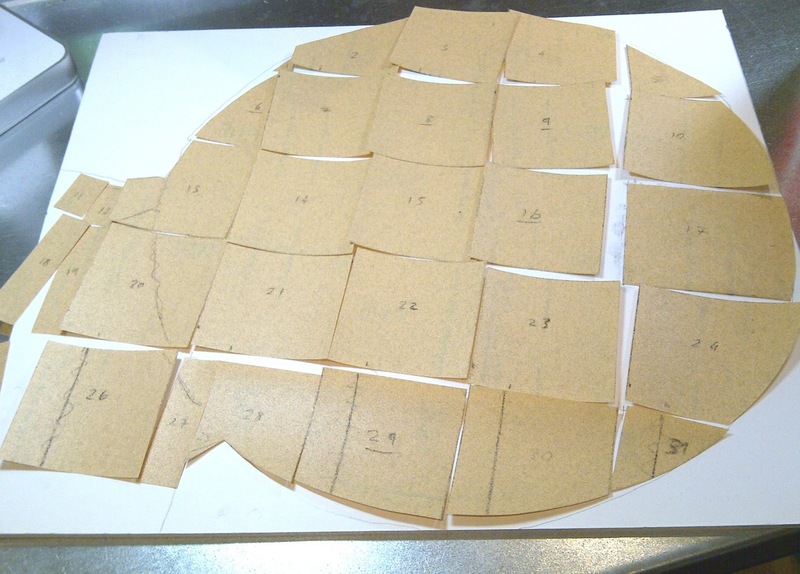 Cut the sandpaper to the overall required shape. If the area is larger than a single sheet, don't worry. Concrete aprons were usually divided into slabs (which is how they are laid) and these will be represented by cutting the sandpaper into pieces anyhow. Just make sure the joins between your sheets can be used as an appropriate join in your slabs. 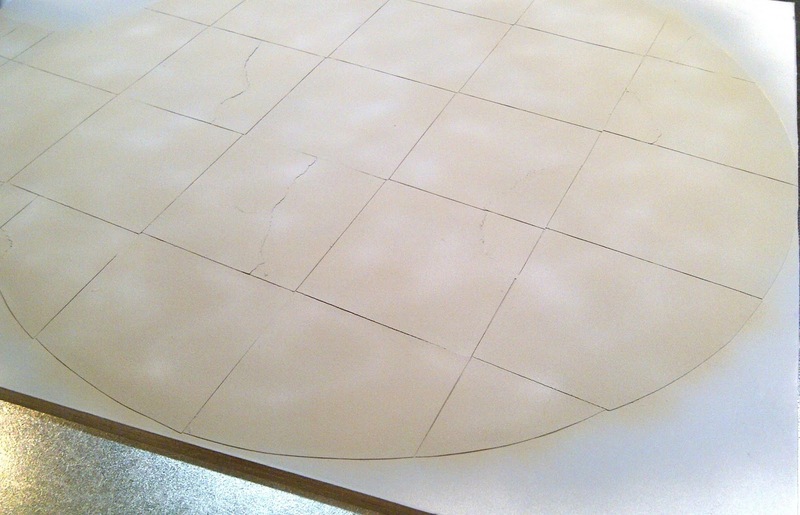 Once you have the sandpaper cut out, mark the outline of the slabs using a pencil. The size of the slabs is down to your own preferences, in practice they came in all sizes. They should generally be square or rectangular and fairly uniform although a few smaller ones may add some interest. Keep the grid uniform even into the edges of your overall shape, so you may end up with some interesting shapes in the corners or along curves. Next, and this is important, you should number your sections before you cut them out so that you can re-assemble everything in the right way. Otherwise you will end up with a jigsaw where most of the pieces look exactly the same and that is not much fun to deal with. Once done, cut the pieces out along your markings. These slab pieces can now be glued to the base board. Use PVA glue or similar for this purpose. It helps to leave maybe a millimetre between each piece to help represent the join between slabs. The sandpaper may tend to curl upward at the edges during this process, so take your time and be prepared to spend some time flattening it down manually whilst the glues takes hold. Also, for a few randomly selected slabs you might like to add some cracks to add some realism to the end result. To do this, simply rip the sandpaper slab before gluing. Just rip, don't try to make it follow a line as the more random it is the better. Although often cracks would appear first across the corner of a slab so make sure you do a few of those. Just glue down the ripped slab in however many pieces you have ended up with. 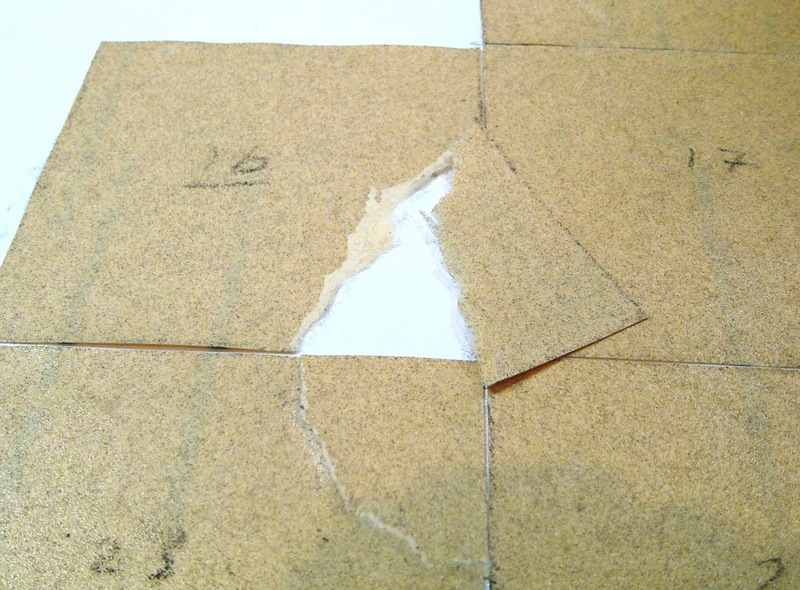 Try to make sure the edges of the rip are aligned correctly and glued down thoroughly. 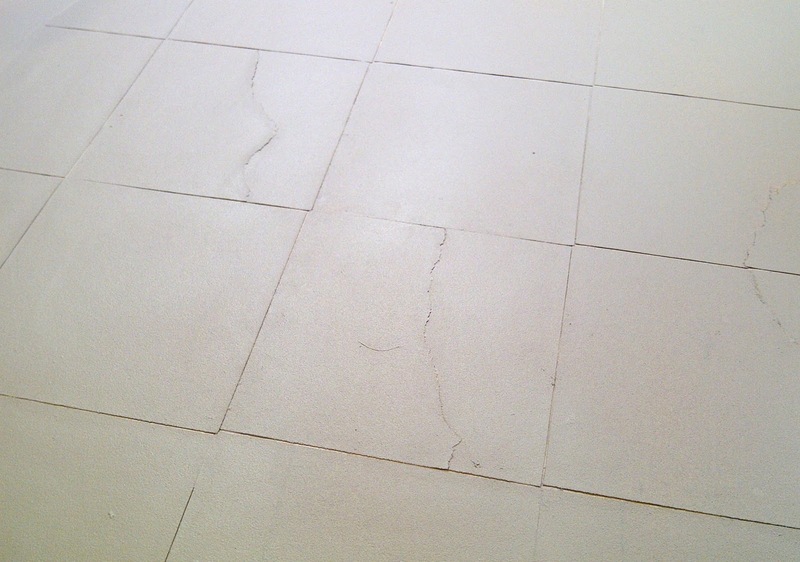 They will still show up as cracks and you don't want the edges of the crack to lift as this will not look right. Once done, let the glue dry thoroughly and also check all the pieces to make sure no edges have lifted. If they have, stick them back down again with more glue. Don't worry about finger, glue and pencil marks on the sandpaper as everything is going to be painted over. Once everything had dried thoroughly, spray the whole concrete area with light grey primer. I use Tamiya surface primer but to be honest any spray primer (e.g. auto primer) will do just as well, although make sure you use a light grey one. Let the primer dry thoroughly. 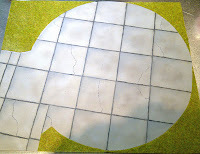 Now airbrush the sandpaper with your base concrete colour. I find a roughly equal mix of light grey and buff (light yellow/brown) works well. 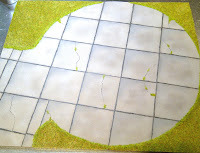 Give the whole area a rough coat, don't worry too much about good coverage, a bit of variation helps with the realism. Next, use a white paint to spray a light random coating. 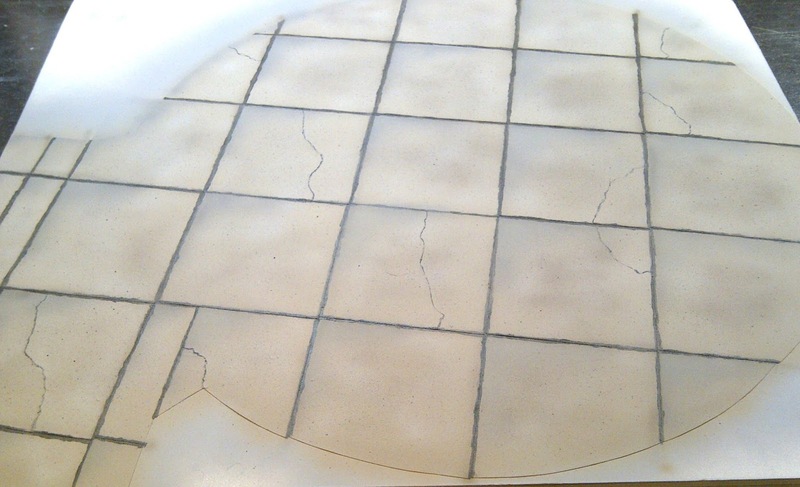 Just wiggle the airbrush briefly over each slab to give a subtle mottling to the concrete. Less is more! Now we want to add flecks of dark colour to the concrete to represent the stones and chips that it contains. I do this by loading the airbrush with black paint and turning the air pressure right down until the paint is just spitting out of the brush nozzle. Then just a few "squeezes" over each slab will result in a nice speckle. Practice the technique on some white paper first to get the hang of it. I then repeat this process with a mid grey and/or brown paint to add some variation. Next we will add some panel weathering to the slabs. Prevailing winds normally push water and dirt to one corner or edge of each concrete slab which results in a subtle darkening in that area. 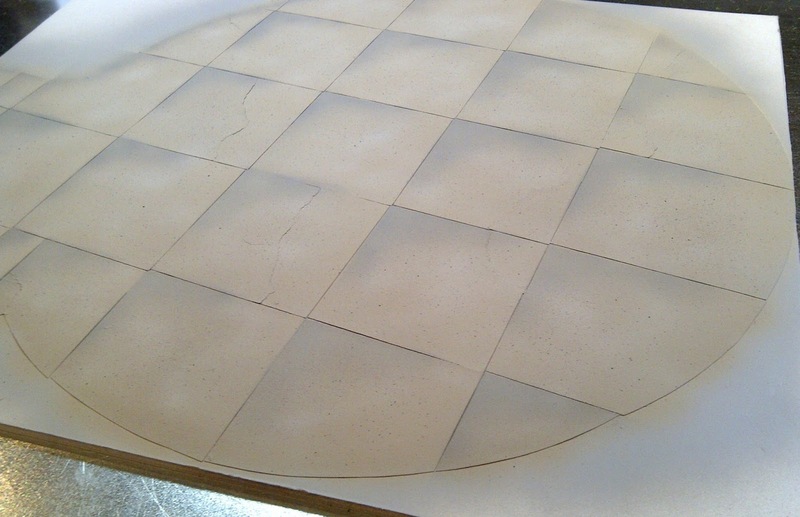 To do this, cut out a right angle about the size of your average slab from a piece of thick paper. Then use this as a mask to carefully cover adjoining slabs and mist a little dark grey from the airbrush into the corner. Repeat for all slabs. This can be a little time consuming but the end result is definitely worth it. A final touch I like to apply is to gently shade the centre of each slab with a little very thin dark brown/black mix (very subtly). Not sure what it represents, but it just adds a little "something" to the result. Now to apply the finishing touches to the concrete. The joins between slabs were normally filled with bitumen which formed an irregular black line along the joins. To do this, I use Tamiya sand texture paint mixed with some flat black acrylic for colour. Basically, you need a lumpy paint and I have heard of some people using normal acrylic or enamel paint mixed with plain flour. I have not tried this myself but in theory it should work fine. The lumpiness of the paint makes for a more realistic effect than using "normal" paint. But you may have to say goodbye to your paintbrush when you have finished so use an old one. Anyhow, this needs to be applied by hand with a thin brush to all the join lines. Don't worry about keeping it neat, it would not be in real life. Just make sure you actually cover the join itself. Any creeping over the edges is fine and the messier the better. Next go round any cracks you have made in the gluing stage with a fine paintbrush and some dark grey acrylic paint to highlight them. Lightly brush the crack edge with the brush just to make them stand out, don't load the brush too heavily and let the paint run on to the sandpaper. That is basically the concrete done, now to fill in what's left with grass. There are a number of ways to create grass effects, from textured paint (don't bother) through scatters right up to static grass dispensers. The latter gives an amazing result if you want long grass, but for these purposes we will take the easy option and use grass matting. This is available from all good model stores and normally comes in a roll. It is basically a paper roll with grass flock already glued to it. It is still quite messy though, as many of the fibres will be loose and you will find everything covered in them by the time you are finished. But they are easily brushed or blown away. 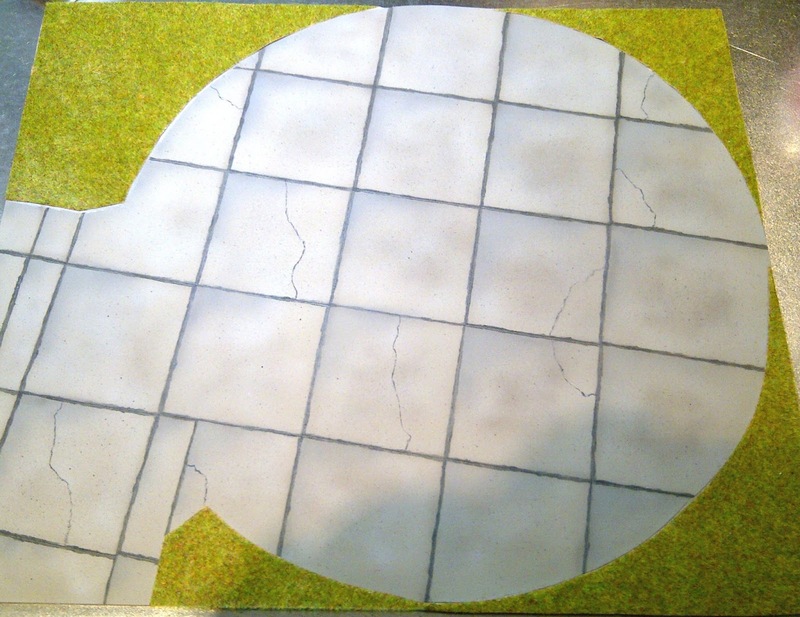 You need to cut the grass mat to the required shapes to fill in the black spaces in your diorama. 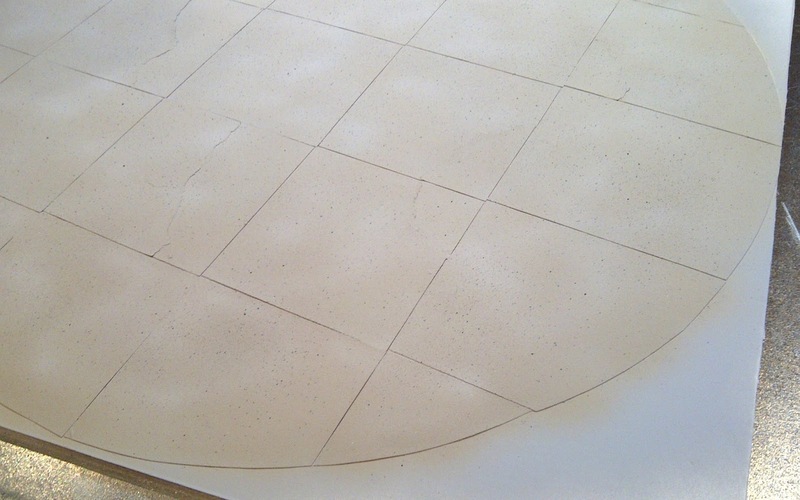 One way to do this easily is to lay a thin sheet of A4 paper over sections of the diorama and rub the edge of a pencil over the area you know the edge of the sandpaper to be. 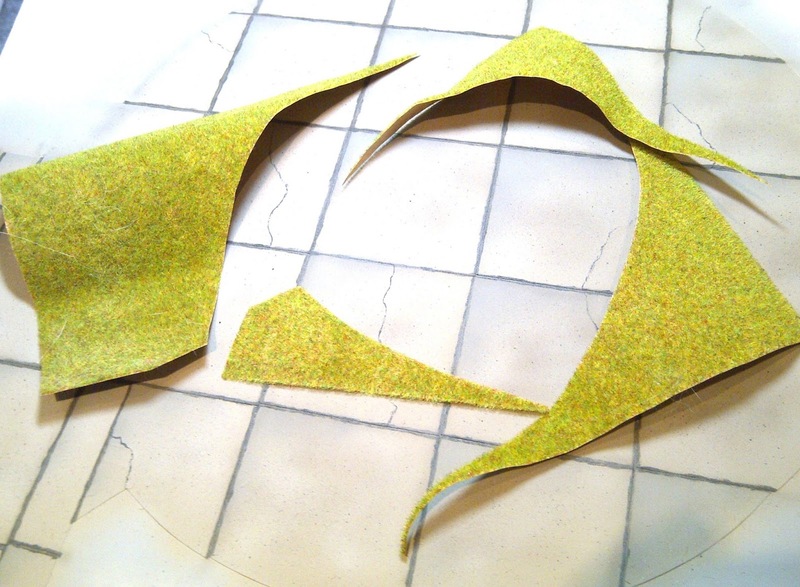 The edge will show through and you can then cut out the paper to use as a template for cutting the grass mat. 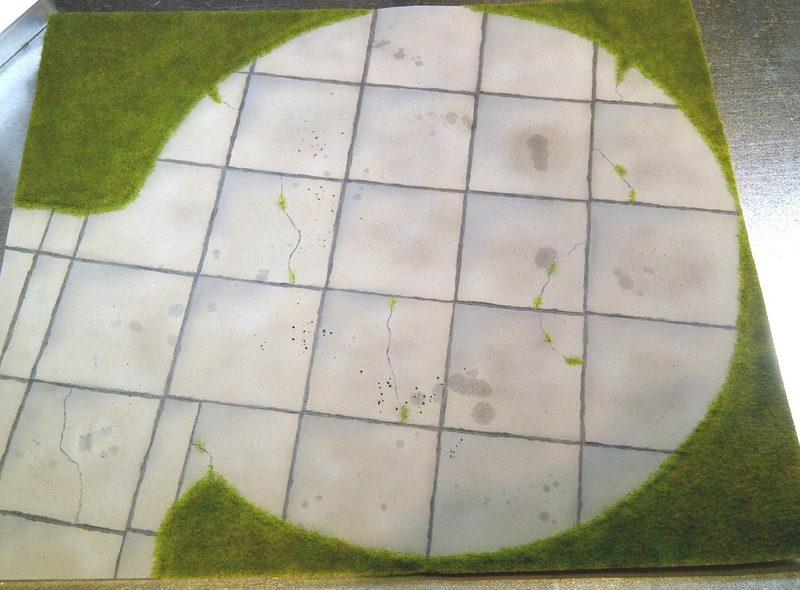 Once you have your pieces, glue the grass mat in place using PVA glue. Don't worry about a perfect adjoining edge with the concrete, we will sort this out next. You may have a gap between the mat and the concrete, or even a light overlap in places. Doesn't matter. In real life, the grass would always encroach a little over the concrete and you would never have a perfectly straight edge. To do this we use grass flock, which is basically the same stuff as is on the grass mat but loose. It will be available from the same place that you bought the mat. Preferably, choose one that is the same colour! Working in sections of a few centimetres at a time, paste a little PVA glue along the join between the grass and the concrete. Make the edge of the glued area a bit uneven, even bulging out onto the concrete in places. Then simply sprinkle some flock over the glue, enough to cover it well. You can then blow away any surplus and you will be left with a realistic looking edge. Continue all the way around your concrete area where appropriate. A nice touch to add next is to show a little grass growing in some of the cracks. Just dab a little PVA on randomly selected bits of crack and sprinkle on some flock and blow off the excess as before. Looks great, doesn't it! 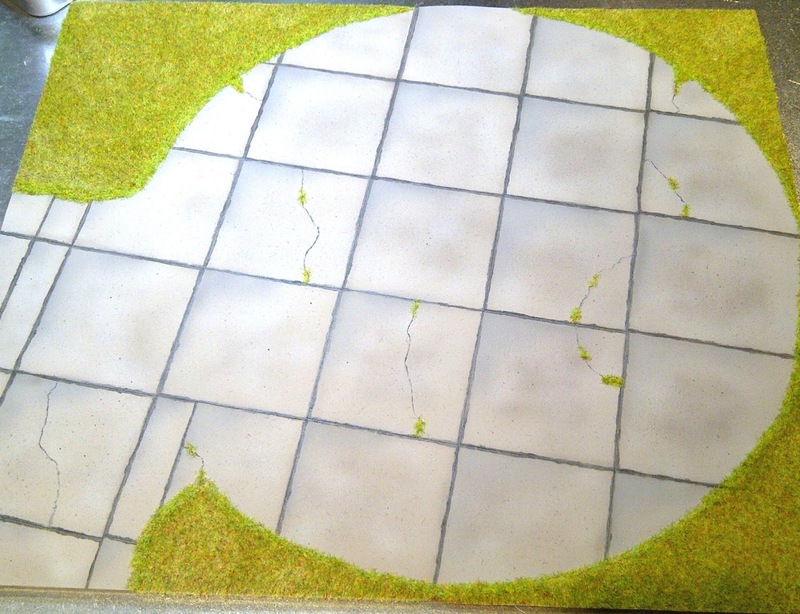 In my example, I wanted a slightly darker green than the grass I was using, so I sprayed the grass a darker colour taking care not to spray onto the concrete area. This means using a fairly low air pressure and getting in close around the edges to avoid unwanted "green concrete". If you so desire, add some stains to the concrete. Real aircraft stands usually have a good spattering of oil and lubricants built up over time. I use diluted black and brown oil paint for this. I first use a highly diluted one for subtle stains and then a stronger one for more "in your face" stains (which you must not overdo). What you do is load the brush well with the diluted paint, and then tap the brush firmly to let drops fall on to the concrete in a random pattern. Again, don't attempt to create any specific pattern, it's important to keep it random. And that about wraps things up. Now you can start adding whatever other items (models, figures etc) to your diorama you had in mind. And also whilst this will look great, to really finish things off you can glue the whole thing to a nicely finished wooden plinth to set off your display perfectly. I hope this has been of interest, I wish you the very best of luck in your endeavours. Happy modelling! What size square of concrete should I use for 1/35 scale model?